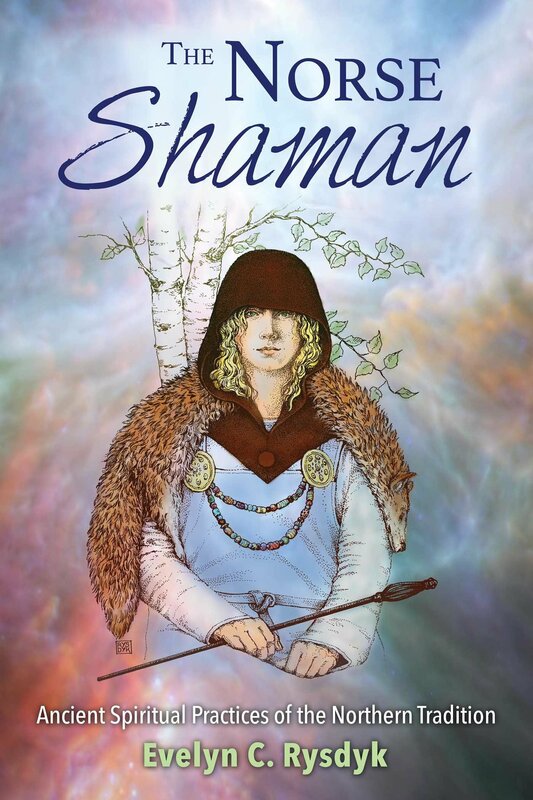 It is remarkable what Evelyn C. Rysdyk has accomplished in her new book, The Norse Shaman: Ancient Spiritual Practices of the Northern Tradition. The rise of the shamanic renaissance is such that I stumbled across this volume at a Barnes & Noble (a Borders-like bookshop in the States). An immediate delight in reading Rysdyk’s treatise on seidr (Norse shamanic journeying) is that it is unusually scholarly for the “spirituality/shamanism” genre. It integrates shamanism, archaeology, and anthropology with a feminist and ecopsychological lens. Rysdyk herself is an American professional illustrator whose maternal grandparents immigrated from Norway. She originally trained with Dr Michael Harner and Sandra Ingerman in the core shamanism model. Subsequently, she trained with indigenous shamanic teachers from the Siberian, Himalayan, and South American regions. A founding member of the Society for Shamanic Practice, Rysdyk maintains a practice in shamanism in Maine. It must be noted that this book assumes the reader has been formally trained in shamanic journeying. That said, chapter 1, “Visionaries in Our Family Tree” contains (before the concluding exercise section) the finest introduction to shamanic spirituality I have ever read. It is a masterpiece of clarity and concision. My gateway into Norse mythology was through my appreciation of Richard Wagner’s cycle of operas, Der Ring des Niebelungen. This led me to the original Nordic and Germanic sources to determine how Wagner had modified them to achieve his unified vision. Rysdyk gives an excellent overview of how the Norse and shamanic worldviews meshed, and summarizes what you need to know about Norse mythology. My subsequent entry into shamanism was through working and training with core shamanic practitioners. Part of my interest in this book stemmed from learning (to my surprise) from a shamanic practitioner that I have Scandinavian ancestry, later confirmed by DNA testing. Further, as a psychoanalyst who is also trained in ecotherapy, I also appreciated the addition of ecopsychology to her discourse. Originating in the 1990’s, it is the latest paradigm shift in psychology. My clinical profession has evolved over the decades from focusing on only the individual. It then moved to considering interaction with the family system, then with the culture, and now with the ecosystem. By introducing current ecological crises into her discussion, she gives contemporary and global relevance of these northern shamanic traditions, beyond personal spirituality work. I especially enjoyed that the book is written from a feminist perspective. This framework allows Rysdyk to bring in anthropology to bear on issues that confound literary scholars concerning the Eddas. As an example, Rysdyk is able to bring understanding to the differential between the gods of Vanaheim (Old Europe matriarchal traditions) and Aesgard (Asian patriarchal traditions). One would never get this from purely literary treatments of this mythological material. Certainly in the recent English translation notes of the Eddas there is no comparable depth of insight. Rysdyk masterfully displays for us what is known about Scandinavian shamanic practice, and how it can be used today. Chapters conclude with step-by-step exercises to help the reader experientially apprehend the discussions. Also helpful are pronunciation charts for the Old Norse letters and words. There is even an appendix on how to make your own seidr hood to wear when journeying. In short, this book is a satisfying smorgasbord of delights.